The creative Harmony House Soup Mixes are the starting point for our popular and timeless Gourmet Soup Blends, and now they are available to you! The Black Bean Chili Mix is the base for our Unbelievable Black Bean Chili Blend, but without the added salt and seasonings! 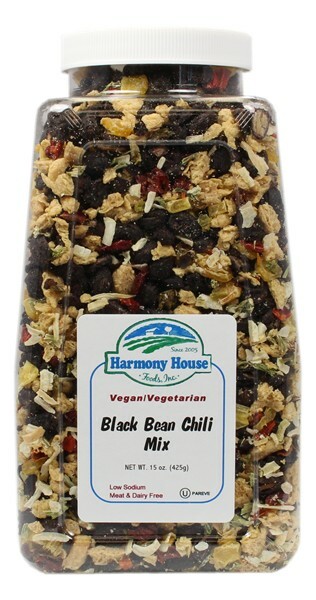 This black bean chili mix begins with our premium Black Beans, and includes textured soy flour, sweet corn, white onions, colorful red and green bell peppers, and crispy celery! In addition to being a perfect chili blend, it has the added benefit of containing 30% of the RDA for Vitamin C in every serving! Make sure to always have a Jar in the Pantry for when company comes over. Save even more by trying all 12 Mixes in one, handy Pantry Stuffer. Stove Top: Add 1 part chili mix packet to 4-6 parts water. Add desired extras and seasonings. Bring to a boil. Reduce heat and simmer for 10 minutes, stirring frequently. Cover, remove from heat, and let stand an additional 5 minutes. Stir gently and serve. Slow Cooker: Mix can be perfectly prepared in a slow cooker. Just add mix, seasonings, and water directly to the slow cooker. Cook on low for about 4 hours. Our Soup & Chili Mixes are an essential part of trail cooking. 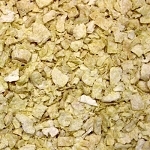 You can pre-measure and season the mix, and put proportion size servings in empty Zip Pouches prior to your excursion. Black bean chili mix can be soaked prior to cooking to reduce the need for fuel. This can be done at mealtime or early in the day to save time during meal preparation. Just open the zip pouch, pour about 1/2 cup water in the pouch, and reseal. When you reach your campsite, simply pour the contents of the pouch into your pot, add the remaining water, and heat to serve.